Today is National Running Day and while I am not running today, I am definitely making progress so that I can get back to running. I had my first post-op orthopedic appointment and things went well for the most part. Unfortunately, however, I am still not cleared for physical therapy yet, but I am hopeful to start therapy in the next few weeks. The doctor says that he isn’t ready for a physical therapist to start being aggressive with my knee, especially because this is a revision surgery. At the beginning of my appointment, my surgeon was telling me about how much of a process my surgery was. The surgery was longer than four hours, and I was under general anesthesia for more than five! I did not realize it was that long. 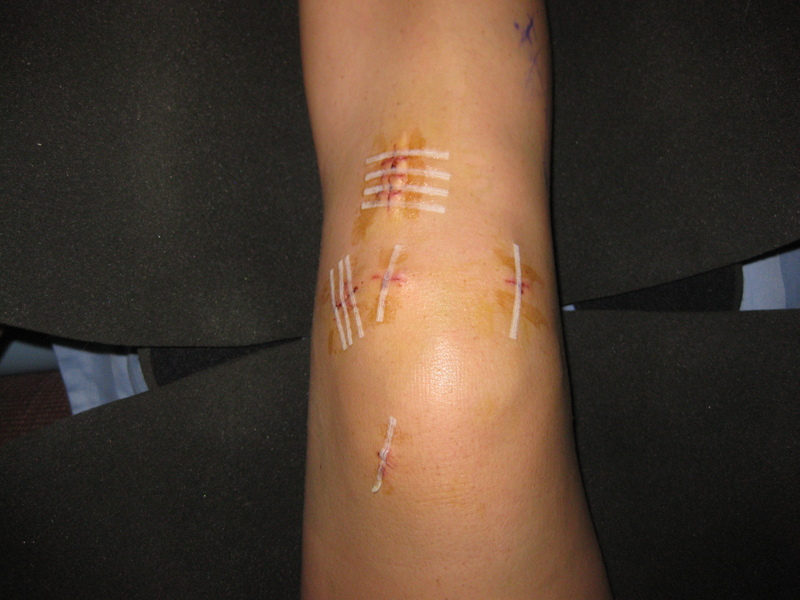 He said that my knee was such a wreck that the surgery was more complicated and took longer than expected. Additionally, I had my stitched removed today. I am 15 days out of surgery, and it was time for them to come out. One of the stitches hurt like no other when the assistant took it out. I felt a sharp, stinging pain as she slowly pulled the stitch from my flesh. In the process, the incision slightly pulled apart (it didn’t look like it was healing quite well in the first place). I felt the color drain from my flesh and my skin clammed up. Oh man was it painful. I must have looked like I was in pain because my doctor insisted I lay down instead of sit. After the stitches came out, the assistant placed sterile strips over each adhesive to help keep the incisions together and to aid with the healing process. On a positive note, he did adjust my leg brace so that I can bend my knee in the brace. Yeah! That is a pretty big step. Now, I can sit normally at the table, in a car, or anywhere for that matter. While I still need to rest, ice, compress, and elevate it, I can sit normally with my legs dangling down. Going to the restroom now will surely be much easier. Also, the doctor said that it is okay if I start going to the gym to use the recumbent bike! Of course, the bike will be on zero resistance, and I will be pedaling super slowly (while reading a book), but I don’t care because I am just so happy that I get to do something now. This will help a whole bunch with my range of motion, and hopefully it stops, slows, or perhaps even reverses the atrophy process. My right thigh is pathetic right now. After two weeks of not using any of the muscles in my leg I can now circle my thigh with both of my hands. Eeewww! I definitely need to get my muscle definition back. Finally, the doctor said that he will try to get me back to running soon. By soon, I am still looking at many months, but just hearing those words was amazing.